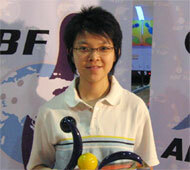 17th June, Manila: Oh Young Ki of Korea and Tang Joh Six of Malaysia claimed their maiden tour title when the Korean defeated Ryan Lalisang of Indonesia, 257-223 while the ABF Tour Philippines leg women's crown went to the Malaysian who edged tour debutant, Marjo Reyes, 198-170. Oh Young Ki, who made the stepladder finals of the preceeding 36th PBC-Boysen International Open but was knocked out by eventual champion, Wu Siu Hong, made amends by defeating Wu's compatriot, Cyrus Cheung in the first semifinal match, 187-143 to take his place in the finals. The final match against Kuwait International Open and the ABF Tour Kuwait leg champion, Ryan Lalisang of Indonesia, was a thriller as both bowlers exchanged strikes in the early stages. But it was the Korean who prevailed and went on to strike home for the highest game of the tournament to claim his maiden title. Lalisang settled for runner-up spot despite knocking out Oh's fellow-countrymen, Jo Nam Yi in the other semifinal match, 227-202. 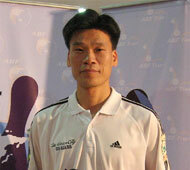 But Lalisang's run came to an end when faced with the in-form Korean. The champion had earlier ousted two Filipinos, Jeff Chan in Round 1 and RJ Bautista in Round 2 before taking on Cyrus Cheung in the semi while third-seed, Ryan Lalisang also eliminated two Filipinos, Biboy Rivera in Round 1 and Tyrone Ongpauco in Round 2 to book his spot in the semi. Meanwhile, Malaysian ex-national, Tang Joh Six defeated tour debutant, Marjo Reyes of Philippines, 198-170 to claim her first tour title. Tang booked her spot in the finals after she had disposed off local hopeful, Jojo Canare, 193-180 in the first women's semifinal match. In the other semi, Reyes ousted Indonesia's Putty Armein, 231-206 for a crack at the title but her fine run came to an end in the crucial finals. The runner-up had earlier knocked out fellow compatriot, Elaine Florencio in Round 1 and last year's Philippines Open champion, Kang Hyun Ji in the second round. The champion knocked out another tour debutant, Raniia Nugroho of Indonesia in Round 1 and went on to beat newly-crowned Philippines Open champion, Liza Del Rosario in Round 2. The ABF Tour Philippine leg was telecast LIVE over NBN (Channel 4) and the highlights will be televised later on local television stations of the eight countries where the tour is being held.